We’d love your help. Let us know what’s wrong with this preview of The Stainless Steel Rat Gets Drafted by Harry Harrison. To ask other readers questions about The Stainless Steel Rat Gets Drafted, please sign up. The Stainless Steel Rat series is definitely an iconic one in the scifi community—it played with the idea of the charismatic criminal in that genre. It seems to me that Harrison’s SSR proved that science fiction didn’t need to just be space ships and ray-guns, it could also involve elements of the thriller and of comedy. In some ways, Jim diGriz reminds me of a more competent, less up-standing version of Maxwell Smart (of the Get Smart TV show) in the way he bumps along from problem to problem. The Stainless Steel Rat series is definitely an iconic one in the scifi community—it played with the idea of the charismatic criminal in that genre. It seems to me that Harrison’s SSR proved that science fiction didn’t need to just be space ships and ray-guns, it could also involve elements of the thriller and of comedy. In some ways, Jim diGriz reminds me of a more competent, less up-standing version of Maxwell Smart (of the Get Smart TV show) in the way he bumps along from problem to problem. These books are light and fluffy. They are great when you need an easy read that will make you smile. As a female reader, you will have to put up with a certain amount of sexism, but at least to my mind it is sexism light. By this point in the SSR franchise, the ideas are quite tired and well worn. This volume is another prequel, dealing with Jim’s early life, but the ideas are basically the same—Jim must think his way out of various scrapes and problems quickly and often in extremely unlikely ways. The basis of this book is making fun of the military, a rather easy target in many ways. Everyone “knows” that the food is awful, that recruits are worked to exhaustion and yelled at, and that the older men at the top stay safely behind while they send the younger men into battle. Harrison pokes fun at all of these ideas. If you have found the previous books to be entertaining, you will probably enjoy this one too. If you were bored or disappointed by the previous volume, I would suggest quitting while you are ahead. These books are not getting better and might be arguably considered of lesser quality than the earliest ones. Book 222 of my science fiction & fantasy project. Opens well enough, and a few daring escapes later, our hero ends up drafted. After that, it becomes clumsy anti-army kind of stuff. The antagonist is a paper-thin caricature. Few daring escapes, little cleverness, one great character (Mark). There is one more sequel to this, prequel to the original book, and I am hoping for better. This seventh novel in Harry Harrison’s Stainless Steel Rat series is actually the sequel to the prequel A Stainless Steel Rat Is Born. Young Jim DiGriz is alone, back in prison, and out for revenge. After he escapes and is tracking his nemesis, he gets captured and drafted into the military. At this point, The Stainless Steel Rat Gets Drafted (1987) turns into anti-military propaganda that doesn’t even try to be circumspect. The army are the bad guys — all ORIGINALLY POSTED AT Fantasy Literature. At this point, The Stainless Steel Rat Gets Drafted (1987) turns into anti-military propaganda that doesn’t even try to be circumspect. The army are the bad guys — all blood-hungry idiots — and they’re preying on a planet who practices Individual Mutualism, an anti-work-ethic cooperative utopian philosophy that could never stand up to human nature. While the Stainless Steel Rat books are definitely meant to be fun, these types of themes come up often enough that I can’t help but think of them as “agendas,” and this particular anti-military agenda is likely to be perceived as insulting and disrespectful to the brave men and women all over the world who risk their lives to protect their countries. Unfortunately, even if you manage to overlook the agenda, The Stainless Steel Rat Gets Drafted offers little new entertainment for fans who’ve seen most of Jim’s antics before. If you haven’t read any of the Stainless Steel Rat books, you’re likely to be more forgiving than I am, and this book is a fine place to start — it will actually help if you haven’t read most of the previous books. I definitely read it before, just forgot. My rating is for "individual mutualism", which's similar to more in-depth Hominids world, but also even more advanced - a society without army or police, probably how it should be, because funding those institutions is just the pure waste of money and effort. If instead of crashing heads of each other for thousands of years over idiotic ideas, like whose god is greatest, they invested time into real things, today we would probably wouldn't had borders, a I definitely read it before, just forgot. My rating is for "individual mutualism", which's similar to more in-depth Hominids world, but also even more advanced - a society without army or police, probably how it should be, because funding those institutions is just the pure waste of money and effort. If instead of crashing heads of each other for thousands of years over idiotic ideas, like whose god is greatest, they invested time into real things, today we would probably wouldn't had borders, and as a consequence - no need in "armies" or arm's race. From my experience, even possibility of such vision for majority is ridiculous. F*cking idiots. The book is an easy and entertaining read. Akin to Catch-22 it tries to show the issues of present-day army. However, it does not try hard to do that. Instead, the author recalls there is a story line to tell and proceeds with that. Although the story features a lot of action, I wouldn't call it an interesting or intriguing one. Even though there some unexpected events, it is safe to assume the protagonist will always come on top no matter what. Even when you think that situation is hopeless, the The book is an easy and entertaining read. Akin to Catch-22 it tries to show the issues of present-day army. However, it does not try hard to do that. Instead, the author recalls there is a story line to tell and proceeds with that. Well, pretty much a lot of the same for our intrepid hero. Stuck on a planet, getting into trouble and finding ridiculously inventive (read: deus ex machina) ways of escaping trouble. There isn't much to say on this book, there is nothing really new in comparison to his previous and the next book. So I am thinking that I might have a bit of break before the next one. To be honest, I use these when I have flights as they are small and light and good for take off and landing. Seventh Novel in the Stainless Steel Rat series, authored by Harry Harrison. Slippery Jim DiGriz is a comedic character dreamed up by Harry Harrison (“Make Room Make Room”) and wrote several novels about Jim and his excuses about why it’s OK to rob and lie and cheat and steal. And yet, the reader can’t help but be immensly entertained! Jim finds himself breaking out of prison on a mission of revenge. His friend The Bishop has been killed by a man who formerly ran a spaceship with Jim and others in the crew. Jim however finds himself in jail. Not a great place to start from. Through various finagling, he finds himself smuggled onto an island nation which is quite paranoid when it comes to military discipline. He somehow gets into the armed forces of the planet, while they are looking for him. He steals aboard a ship bound for invasion of a peaceful planet in an uncharted area of the galaxy. Harrison introduces us to Individual Mutualism – a crazy mix of socialism and and odd reference to let others be as they are. Trippy. Some critics consider this seventh book in the Stainless Steel Rat series as anti-military but I consider it hilarious parody of the military system. A must-read for sergeants and admirals everywhere! Хан Соло, Снейк Плискин, Корбен Далас, Капитан Майкъл Рейнолдс, Ридик, Спайк Спийгъл, Питър Куил... Съвременната фантастика е бъкана с чаровни анти-герои, някои лениви и лежерни, други тарикати, трети устати, а повечето всичко от изброеното на куп. Брадясали циници, отегчени от живота, плюещи (че дори и хапещи, дращещи, стрелящи...) по системата, всеки със своето тъмно минало и лични демони, и всеки въоръжен с богат репертоар от хапливо-иронични лафове. И дълбоко, под тази яка черупка, зад маска Хан Соло, Снейк Плискин, Корбен Далас, Капитан Майкъл Рейнолдс, Ридик, Спайк Спийгъл, Питър Куил... Съвременната фантастика е бъкана с чаровни анти-герои, някои лениви и лежерни, други тарикати, трети устати, а повечето всичко от изброеното на куп. Брадясали циници, отегчени от живота, плюещи (че дори и хапещи, дращещи, стрелящи...) по системата, всеки със своето тъмно минало и лични демони, и всеки въоръжен с богат репертоар от хапливо-иронични лафове. И дълбоко, под тази яка черупка, зад маската на корав тип с ампутирана съвест, дреме златно сърце, което често подтиква към неохотно забъркване в чужди неприятности и дори евентуална саможертва. Как да не ги обичаш, нашите сай-фай анти-герои и космически каубои? Summary: Jim diGriz is out for revenge, going after the man that killed his mentor, the Bishop. Only, this man is a big-wig in a secret military machine. Adventures and scrapes abound. Whenever I'm feeling low on smarm, I pick up a Stainless Steel Rat book and top myself right up again. "Gets Drafted" is my favorite SSR book by far, partly because I can see myself as the luckless Morton, in the wrong place at the right time, getting dragged along on every adventure possible, a reluctant Wooster to Slippery Jim diGriz' Jeeves. Way back when, I even started writing a SSR-like novel, but it never got much beyond the first chapter; I'm too much like Petey Otterloop in Richard Thomps Whenever I'm feeling low on smarm, I pick up a Stainless Steel Rat book and top myself right up again. Not one of the better books in the series. Less "laugh out loud" moments than in the other books. Still enjoyable enough to pass the time, however. I would rate it as 3.5 stars. Easy to read, but it's more for teenagers. My favorite of the Stainless Steel Rat books. This is the good old days of the Stainless Steel Rat. The Stainless Steel Rat series was an excellent and entertaining read. This whole series was wonderful when I was young. I loved it. Ths begins almost immediately after the close of the last book. This is a very rare occurrence in the life of the Rat. And while it does add to the immediacy of the story it does make the reader want to compare the two adventures more than they might normally. Which is a shame because this is probably the weakest of the Rat's adventures so far: it's a good fun read, but it covers no new ground, feels like a rerun of capers past and has possibly the clunkier exposition in a series that relies on Ths begins almost immediately after the close of the last book. This is a very rare occurrence in the life of the Rat. And while it does add to the immediacy of the story it does make the reader want to compare the two adventures more than they might normally. Which is a shame because this is probably the weakest of the Rat's adventures so far: it's a good fun read, but it covers no new ground, feels like a rerun of capers past and has possibly the clunkier exposition in a series that relies on exposition as part of its tropes and formulae. Put simply, it's a bit of a dud. An entertaining dud but it contradicts a few points of continuity - the idea of interplanetary invasion being expensive and pointless, for one; the continuing references to Earth/ Dirt, although that ship sailed very early on in the series, to be honest; and the entirety of the plot of The Stainless Steel Rat's Revenge seems to be cribbed here, if I'm honest - but we do get a deepening of Jim's personal philosophy as well as a few glimpses into his life that we hadn't had before, so it's worth it for bridging the gap between the callow youth we met in the previous book and the seasoned criminal we meet in the (actual) first novel of the series. So, despite the fact that this is a prequel, this is the best of the series that I've read so far. Very, very novel characters in this one, and not only for this character. Very interesting twists. I enjoy the involvement of a robot in this universe that is sentient finally. I hope the books that follow this one continue to improve in quality. Добра история, най-вече с многото осмиване на армията. Не е най-доброто за Стоманения Плъх, което съм чел. I like all of the Stainless Steel Rat books. They are just fun science fiction. Witty in all the right ways and in all the right places. While in the previous prequel, the opening premise (young Jim DiGriz getting himself arrested as a means of enrolling in some hypothetical academy of crime) is just that – an opening, breezed through pretty quickly before moving on to other things – here our freshly graduated Stainless Steel Rat doesn’t get pressed into military service until page 60. The book isn’t War & Peace, but with this slightly stretched route to the crux of the plot it begins to feel overlong for a Rat caper. That’s n While in the previous prequel, the opening premise (young Jim DiGriz getting himself arrested as a means of enrolling in some hypothetical academy of crime) is just that – an opening, breezed through pretty quickly before moving on to other things – here our freshly graduated Stainless Steel Rat doesn’t get pressed into military service until page 60. The book isn’t War & Peace, but with this slightly stretched route to the crux of the plot it begins to feel overlong for a Rat caper. That’s not to say the journey isn’t fun – the spirit and tone are there, but the first few chapters are more like a pleasant diversion before we get to the nitty gritty. Not that a Rat book is ever going to be gritty. From there on the story comes alive a bit more though and the author warms to his subject matter, ripping into the bureaucratic and blinkered mentality of the military machine. And no sooner has Private Rat enlisted, he’s moving up the ranks in a nice twist on self-promotion. Then he’s Oscar Mike on an interplanetary invasion. And just as Harrison enjoys playing with the military, he rolls out another different society model (building the impression of a wonderfully colourful variety of worlds making up his League universe) and has fun with that, pitting the invading force against a thoroughly pacifistic and altogether genial populace who embrace a philosophy known as Individual Mutualism. I’m not sure how it would ever work in practice, but it’s a nice idea and incidentally strikes a nice satirical note against our current system of rampant-monetarism-gone-horribly-wrong. You’ve got to love the ‘currency’ unit of the wirr. The usual combination of ingenuity, incident and accident drive the plot forward and there’s no lack of momentum as you’d expect, with Jim occasionally dropping himself in the cagal with a rash and ill-considered move, reminding us that the young rodent is still a bit wet behind the ears. And you expect a generous helping of serendipity to bail him out from time to time, although it’s a tad disappointing here that the conclusion relies too heavily on one of these fortuitous rescues. Taken together, it’s also something of a shame that both see Jim working for the League Navy as between the prequels and his actual debut it paints him as having spent way more time as an agent than as a crook. All in all, perhaps not Grade A Stainless Steel, but good (and mostly clean) fun. And with names like Zennor and Praze-an-Beeble cropping up in a sci-fi book, you have to wonder if Harry Harrison holidayed in Cornwall around the time of writing. Which would explain some of the lazier aspects of the plot – I get that too from time to time. Slippery Jim diGriz is engaged in another adventure that stays true to the manner of his previous exploits in that he is a criminal with a good side and there is a great deal of meaningful social commentary. In this case, Jim is determined to avenge the death of his crime mentor, The Bishop. The trail leads him to the nation of Nevenkebla, ruled by a strong military based on a state of emergency that has been in place so long that no one recalls why it was implemented in the first place. All m Slippery Jim diGriz is engaged in another adventure that stays true to the manner of his previous exploits in that he is a criminal with a good side and there is a great deal of meaningful social commentary. In this case, Jim is determined to avenge the death of his crime mentor, The Bishop. The trail leads him to the nation of Nevenkebla, ruled by a strong military based on a state of emergency that has been in place so long that no one recalls why it was implemented in the first place. All males are subject to being conscripted and it is truly a state within an army. Being male and within the age limits, Jim ends up in the army, part of a powerful force that is about to invade and conquer the most peaceful of planets. One where there is no army or even a police force. In his attempts to escape his fate, Jim has taken the position of an officer in the invading army, so he is determined to avoid casualties on both sides. The story is basically an indictment of the military mind, both in how it is ignorant and inflexible while always looking for enemies to justify their existence. It is humorous and the satire is effective, for it is based on the military-industrial complex run to an extreme conclusion. Where a war with dangerous enemies must be created in order to keep the military leaders and their cronies in power. As is the case with the best social satire, it is based on a great deal of truth. 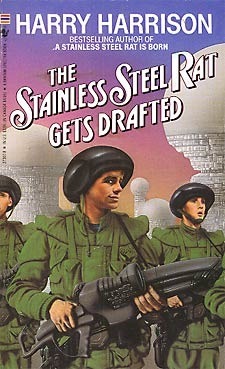 The Stainless Steel Rat Gets Drafted = Full Metal Jacket x Starship Trooper + Monty Python. In my opinion this is the best book in the series. Absolutely ridiculous, funny and brilliant at the same time. The second book chronologically, but written out of sequence. Jim DiGriz is locked up after his last adventures, escapes from stir and seeks revenge on the man who was responsible for the death of The Bishop, Jim's mentor. The trail leads to him joining the army, taking an unwilling part in an interplanetary invasion, thwarting the enemy's plans and saving the world. After the disappointing A Stainless Steel Rat is Born, I was beginning to think that my teenage enthusiasm for all things DiGriz mi The second book chronologically, but written out of sequence. Jim DiGriz is locked up after his last adventures, escapes from stir and seeks revenge on the man who was responsible for the death of The Bishop, Jim's mentor. The trail leads to him joining the army, taking an unwilling part in an interplanetary invasion, thwarting the enemy's plans and saving the world. After the disappointing A Stainless Steel Rat is Born, I was beginning to think that my teenage enthusiasm for all things DiGriz might not last the test of time. Not so with this installment. Perhaps HH's writing skills aren't as appealing to me in middle age as they were in the first flush of youth, but this is an entertaining, more polished story than the first one. Things go up a gear once Jim actually joins up (gets drafted), and he lurches from one crisis to another. He is perhaps made a little too invincible for complete credibility, but you really need to park your brain and switch off the ignition to enjoy these stories. Do that and you'll be fine. HH delivers his hero's adventures with a light humorous touch, although perhaps I got a little lost when he got into the individual mutualism thing, but that may actually have been his intention. I do love this character, but having read about him when he is older, I have a slight problem worrying about Jim's health when he is young. I guess I know that he will be okay because I have already read about him in the future. That is the problem with prequels. Other than that, I did enjoy this book, but I found this to be the weakest of the SSR books. I did enjoy the first third and the last third of the book, but found my mind wandering a little in the middle of the book. Why? I can't say. T I do love this character, but having read about him when he is older, I have a slight problem worrying about Jim's health when he is young. I guess I know that he will be okay because I have already read about him in the future. That is the problem with prequels. Other than that, I did enjoy this book, but I found this to be the weakest of the SSR books. I did enjoy the first third and the last third of the book, but found my mind wandering a little in the middle of the book. Why? I can't say. There are quite a few entertaining sections in this book as Jim works his way up the levels of the military by stealing different uniforms. I also enjoyed trying to figure out how he was going to save the race of passive humans from the invading military. My overall impression of The Stainless Steel Rat Gets Drafted is that it is a good book, but it isn't great, like some of the others in this series. I rated this book a 7 out of 10.